Understanding the lifetime value of a patient is crucial when marketing your practice. Lifetime value, or LTV, is a particularly important metric when you are spending money on paid search/PPC/Google Adwords. And we all know the power of being able to drive down the cost per click and acquisition. By reducing costs, you will be able to spend more on marketing and scale! 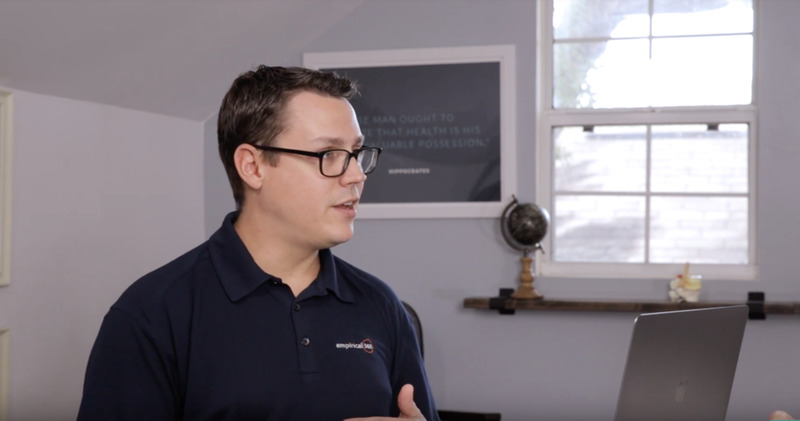 Below is a conversation that I recently had with Matt Adams of Empirical360 here at The Evidence Based Chiropractor HQ where we dive deep into the lifetime value of a patient in your practice and how to maximize your returns. Jeff- Let's dive right in- what's been your experience as far as how many chiropractors or service professionals know the lifetime value of their patient's and what does it mean to their practice? Matt- So you start with the first question there. The number of chiropractors that I've talked to that has a definitive answer on the lifetime value of a patient is probably close to zero. I don't think that that's through any fault of their own. It's a complicated question to answer. The reason that lifetime value is so fundamentally important is it's how you can base your decisions on your marketing efforts. Lifetime value helps you assess the health of your practice in regards to patient retention. Are you offering enough services? Are you seeing patients drop off during their care plan? Are referrals coming in? By understanding lifetime value, you can start to answer these questions. Jeff- The challenge is that a lot of docs get pulled into the weeds when they attempt to calculate LTV. But, in essence, it's quite simple. Just take your total revenue, divided by the number of patients, within a specific timeframe. And that's the easiest way. But using time as the variable, you can do a comparative analysis of let's say last year to this year. Has your lifetime value over time been increasing or decreasing? If you're doing a good job retaining, if you're doing a good job interacting with your patients, and they are coming back into your practice at different points in time it should continue to ascend. And if it's flatlined or it's going down as the year's progress, then that is probably a good indicator that you lack long term retention. Matt- Yeah absolutely. So there's a couple of different ways that you can look at this as well from a practice standpoint. If the past year is less than what it was four years ago you may ask yourself- did I stop sending out e-mails for patient retention? Did I quit sending out e-mails to get those google reviews and keep people engaged? If you know, last year your revenue numbers for lifetime value are less than what it was four years ago. You have an issue. Another way to way to look at it is based upon your marketing. Again tying back to your e-mail campaigns and getting people engaged through social media, etc. Jeff- How does lifetime value play into making good decisions with Google Adwords and PPC advertising? Matt- Yeah it's huge. So it's paramount for us because again we have our own proprietary CRM. We encourage all of our clients to use this not just for the sake of it, but because it's fundamentally important for our clients to be able to grow their practice. But when it comes to having a lifetime value assigned to a particular patient, that's when you can go back to a specific ad, which developed into a lead, and help you optimize your campaigns. We want to be able to maximize towards an actual sale happening, revenue being generated, above and beyond just a lead being created, which is where most marketing companies fall short. Who cares if a point has been created if it generated no revenue for you. So when we look at our CRM, and we see all these different lifetime values that were assigned to this particular campaign which generated that appropriate action step and conversion. That's the importance behind that because then you're getting the most bang for your buck when it comes to your marketing. Jeff- What are somewhat are some individual factors that you've seen that can affect lifetime value? For instance, your lifetime value may be different in you live in Manhattan compared to Lexington. What are some of the various factors where not everyone is going to have the same lifetime value, and that's okay? Matt- I would really wouldn't be able to answer that question. And the reason for that is because when I speak to chiropractors about knowing the lifetime value, they don't know the answer to that. So I don't have anything to assign it back to, whether it be demographics, geographic location, etc. But insurance reimbursements are different across the country, and so that's important to know. Because if somebody has a $1,000 marketing budget and has a lifetime value of $300 per patient and we get the three new patients...we're in the red. Whereas if I talk to somebody in different locations that are saying, "we'll make about a $1,000 from every new patient, and I spent $8,000. Well, now they've doubled their money. And so that is a necessary component to your marketing. And that's what's fundamentally important because then as a marketing agency I can tell you if you're going to spend a $1,000 with us and you're saying me that your life lifetime value is $300 per patient and then I may tell you PPC may not be the best option for you right now. Yeah, maybe you do a little bit more social media or organic search. Jeff- And I think that gets back to some of the points that we've chatted on earlier episodes. Understanding not only the lifetime value that's going to set the anchor but the secondary component of having proper keyword targeting so you're not competing at a level that's beyond the scope of what you can do to increase your conversion rate. The amount you pay per click pay is the advertising amount that you're starting with as the patient goes down the funnel of acquisition so to speak. And if you don't know the lifetime value, you going to have a difficult time deciding as the conversion steps increase along the acquisition cycle. Matt- Oh yeah absolutely. You know marketing agencies are excellent, but that's also why we prefer to call ourselves a revenue-generating agency. Jeff- Messy data is not only a chiropractic issue. There are a lot of health care companies that also get stuck in paralysis by analysis and have difficulty making the right decision. The sooner that you understand your data, you will have a competitive advantage, and that's an essential part of doing paid search. Any competitive advantage you can have that drives down the cost of that click or that acquisition is a perfect thing because that enables you to scale. Matt- Yes absolutely. You need to know where your new patients come from. You don't want to be in the situation where you're looking at your patients and all the information and data that you have for your practice and saying I have no idea what to do going forward. So your data being clean is probably the most important thing. Jeff- That's an excellent point. You are segmenting out what's what's working and what's not — balancing out branding and sales. You've got to balance short term strategies and long term objectives. And I think that's a that's a tough situation as well as the dilemma of the entrepreneur and the business owner. Many times you start doing things that work, and then you stop doing those things for no good reason! I'm sure that you see that all the time. Matt- Yeah absolutely. Again it becomes kind of a snowball effect you get going down the path of having different systems and ideas, and you spin off in one direction and you it becomes a very challenging thing to dig yourself out of it. So the better you can clean your data, know your sources for where patients are coming from, and have definite and assignable value for patient acquisition- it will help the growth of your practices is that plain and simple. Jeff- I think that's a that's a very good ending point. And I encourage everybody if you have questions about lifetime value to throw them down in the comments below. I know Matt, and the team at Empirical will take a look. I'll take a look. We're happy to work with you answer any questions that we can to help you get a better grasp as far as what's going on in your practice with lifetime value.